Do you have your cloudometer ready? How will you know if Cloud Computing is delivering what it is supposed to? Do you know what metrics your business or organization values? Do you know how many metrics are the right number to govern this emerging service? In this presentation, Jason will drill into how IT Service Management best practices highlight the need for continual service improvement. We will discuss the importance of and techniques for defining, measuring, controlling and managing Cloud Computing services using ITSM best practices to ensure a successful balance between the customer experience, cost and effectiveness. 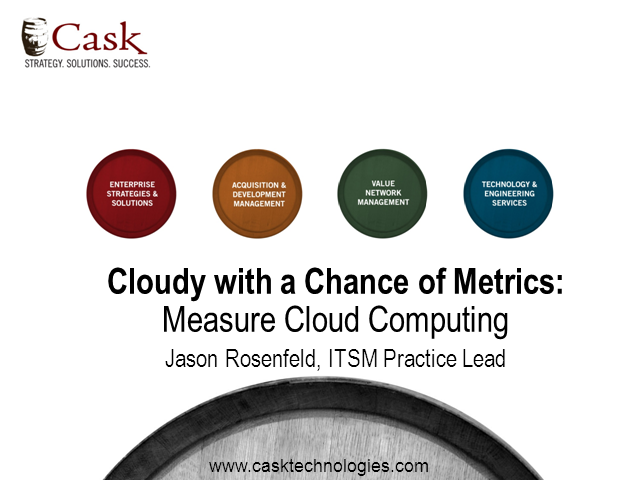 Jason Rosenfeld is the IT Service Management Practice Lead at Cask Technologies. He is an expert hands-on advisor specializing in Agile Service Management, IT Governance, Tool Procurement, Operational Maturity Assessments, Outsourcing Valuation, and IT Analytics.